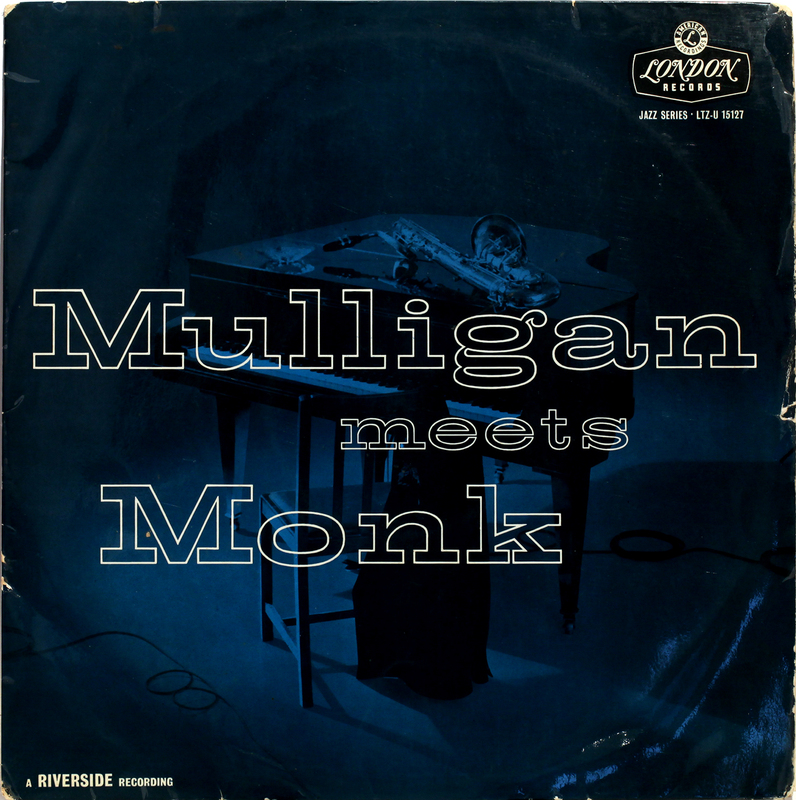 An improbable combination: master of the baritone sax Gerry Mulligan and iconoclast of the “off-key” piano Thelonious Monk, resulting in beautifully crafted artistry. Recorded in 1957 for Riverside, first released here in the UK on London American the same year, it’s a one-of-a-kind piece. I had a VG copy for a while, but replaced it recently with a better copy, though not without the occasional click itself. Some records are near mint for the reason that they are not worth the effort of playing a second time. 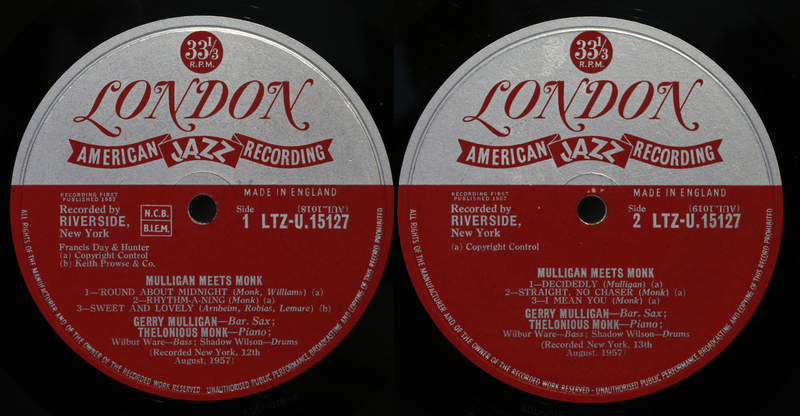 Both these copies showed frequent-play spindle marks, indicating a recording that demanded to be played, again and again. A problem of success. The standout track is Monk’s much loved classic “‘Round about Midnight”. The melodic tension between the baritone and piano is remarkable. The dark and menacing theme is perfectly matched to the throaty lower register of the baritone as it climbs the discordant scaffolding of Monk’s chords, reaching upward for emotional release. The entry of the rhythm section lightens the mood with a swinging lilt, only for it to return in the end to the darkness. A spellbinding interpretation from two masters, showing how it can be done. 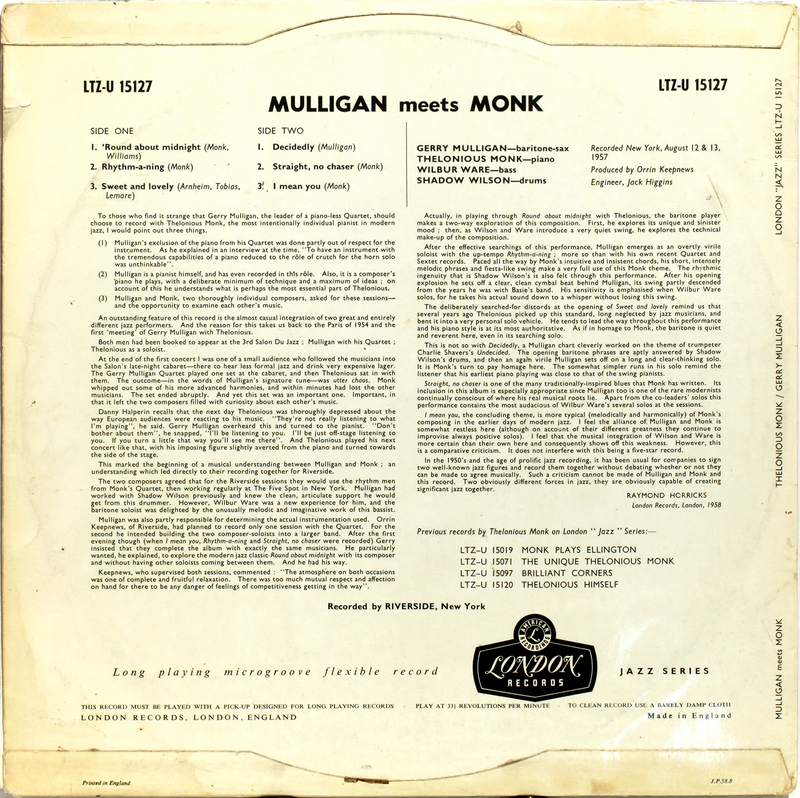 This entry was posted in Gerry Mulligan, London, Thelonius Monk and tagged Gerry Mulligan, Jazz, Thelonious Monk, Vinyl by LondonJazzCollector. Bookmark the permalink. These London issues of Riverside originals are great and from my experience prices are much lower. I have got a copy of The unique Thelonious in near mint condition and it is a fantastic record in really great pressing quality. Agreed. US originals on Riverside and Atlantic are impossible to find, and why try when these lovely crimson/silver label London’s offer you the same access to music with great pressing quality. But hey, lets keep it quiet – ebayers are everywhere!